A massage can be one of the most relaxing things many people can experience. After a stressful day, a nice rhythmic rubbing of the sub-dermal tissues can just melt that tension away. But why should humans be the only ones to get delightfully deep massages? After all, we’re not the only ones with stressful lives. A full day of stick-catching and best-friend-being is just as exhausting to Rover as a jam-packed day of chores is to us, if significantly more pleasant. But what does massaging really do? A quick search through the ‘intertubes’ reveals a myriad of results, everything from the sane and logical to the slightly less so. At its most basic, a massage is the poking and rubbing of the skin and muscles. This (when done properly) is good for relaxing any tightness or tension, which in turn can relieve soreness and weakness. Also, tense muscles have a tendency to restrict the flow of bodily fluids, so relieving the pressure can bump up circulations. Lastly, a loose muscle is a injury-free muscle! A supple muscle won’t strain or tear, but a tight one is much more prone to such injuries. Think of the difference between a brand new elastic band, and a dry and crusty elastic band. Doggie massages are very similar to those of a more human nature, especially in that there are two major veins of it: casual and professional. Casual is something that anyone can do in their homes and is moderately pleasant and relaxing. 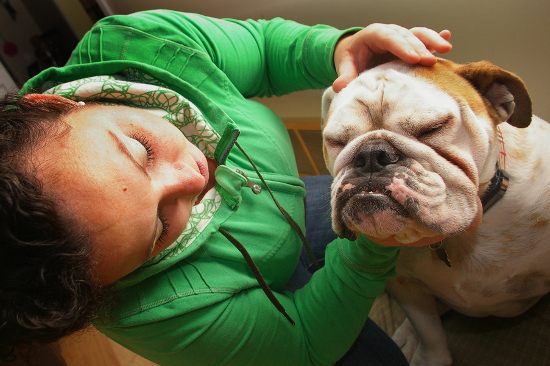 In essence, the casual pet massage is very much like a long, focused form of petting; not too much force, but just enough to lightly rub the muscles under the skin. For a deeper massage it is necessary to go to a pet masseuse. There are lots of them out there, all accessible with a little bit of local research. Professional massages are much more effective than any preformed by untrained hands, and have boosted benefits over the casual pooch rub-down. 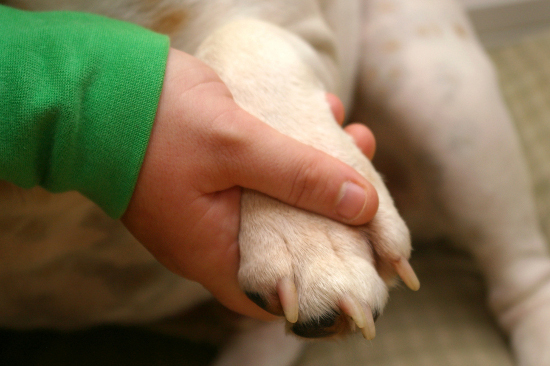 Want to learn the intricacies of canine massaging? There are many accredited courses on the subject and most of them can be completed online. Be warned however: these aren’t flakey programs, they are long and intense. For those interested, check out TreeTops Animal Massage Education. All this said, don’t forget that pets are like people – every one has a different personality and different likes and dislikes. While many pets and people enjoy messages, there are those that quite decidedly do not. If a pooch, at any point, expresses discomfort it’s important to stop immediately. If they were enjoying the massage before that point, just repeat what the doggie liked. Remember, wrestling shouldn’t be a part of the dog massage! But if everything goes right, a nice massage could be just what Rover needs after a hard day of being the best dog he can be.